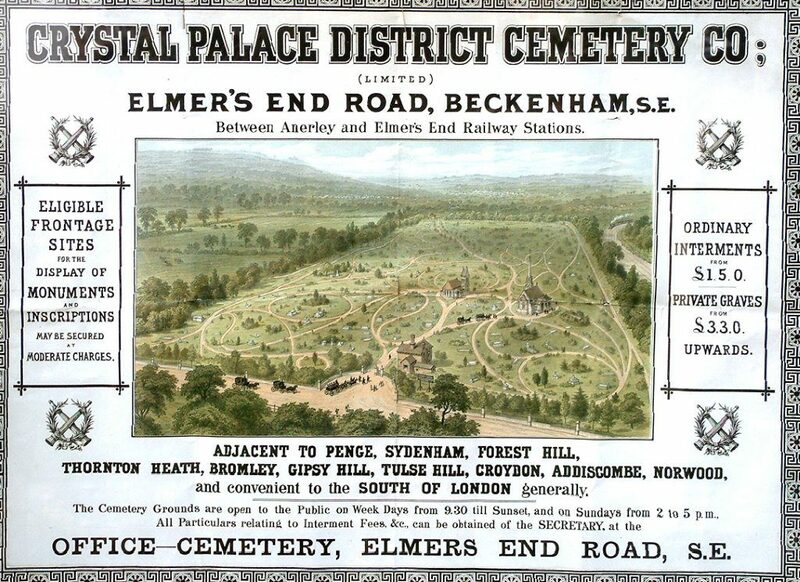 Beckenham Crematorium and Cemetery is the full name for the facility which opened in 1876 as the Crystal Palace District Cemetery – see poster below. The aerial view painting used in the poster shows that the 41 acre site remains largely unchanged today. After one of two chapels was closed in 1956 the other was converted to provide both a chapel of rest and a Crematorium. On the right of the picture can be seen a steam train running from Crystal Palace to Birkbeck stations. Today this line has become used jointly by British Rail and the East Croydon to Beckenham Junction trams. For information about each of 130 World War I casualties who are remembered in the Cemetery can be seen elsewhere on the BHG website here. 21 members of the Beckenham Auxiliary Fire Service who were killed in the course of a single night (19–20 April 1941) during a German raid on the East End of London in World War II. Members of Beckenham’s Civil Defence forces . In days of yore, the 54 bus passed through Beckenham from Croydon to Woolwich Arsenal. It had been the main bus route linking Woolwich, Lewisham, Beckenham and Croydon since the 1920s. Since the introduction of the trams in May, 2000, the 54 bus has terminated at Elmers end Station. The Story of Bromley Road, Beckenham by Cliff Watkins. The photo below is a postcard franked 1935. 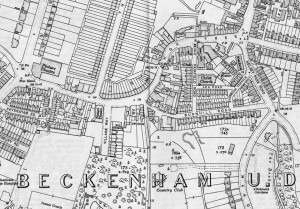 It shows how the road was laid out curving gently away from Beckenham High Street. 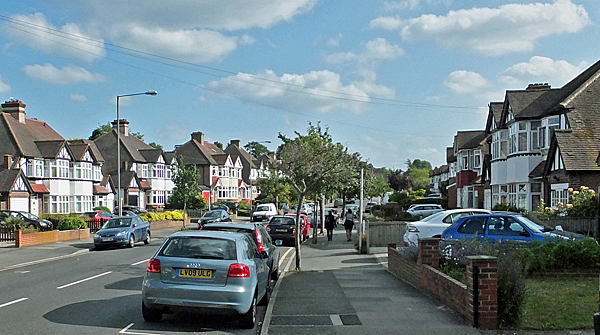 Village way runs from the High Street for over a mile to Upper Elmers End Road near Eden Park Station. It is unique in that it is bordered by three parks. From the High Street end, these are Croydon Road Recreation Ground on the right and a half mile further along on the same side is Crease Park. Before the third park are the traffic lights at the cross roads (with Stone Park Avenue on the right and Crossways Road). When the road was first built, these cross roads were at the highest point in central Beckenham at 175ft above sea level. (Within the Beckenham UDC area, the highest point was at Rock Hills (Paxton’s home) which is 280ft.) Because of accidents Stone Park Avenue was lowered to give better visibility to traffic. Beyond the crossroads in Village Way, on the left is Harvington Recreation Ground adjoining St John’s Church at EdenPark. Village Way did not exist when this map was published circa 1911. Later it would join the High Street south of ‘The Cedars’ (formerly ‘Village Place’) through the field shown between Elm Cottage on the left and Austin’s pork butchers shop next door to the Three Tuns P.H. on the right. Since the Boer War, Elm Cottage had been the local headquarters of a battalion of the West Kent Regiment. The next map was published in 1930. Village Way is shown as a cul de sac. The Cedars has been replaced by a shopping parade and its land used for the 1920’s housing estate which began with The Drive opposite the Pavilion Cinema. The cinema opened in 1914. This 2012 map was supplied by Bromley Borough Council. Both the cinema and Austins have been replaced by shops. 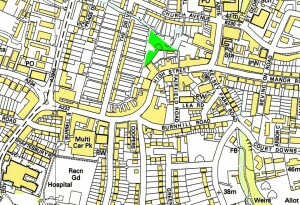 The Three Tuns building, now Zizzi, is hidden on the map by the new private road called Coopers. On the left, St Edmund’s Catholic church is shown but unnamed on the map. Sainsbury’s is not labelled except for its car park. This park is in the centre of the Town with easy access from the High Street. 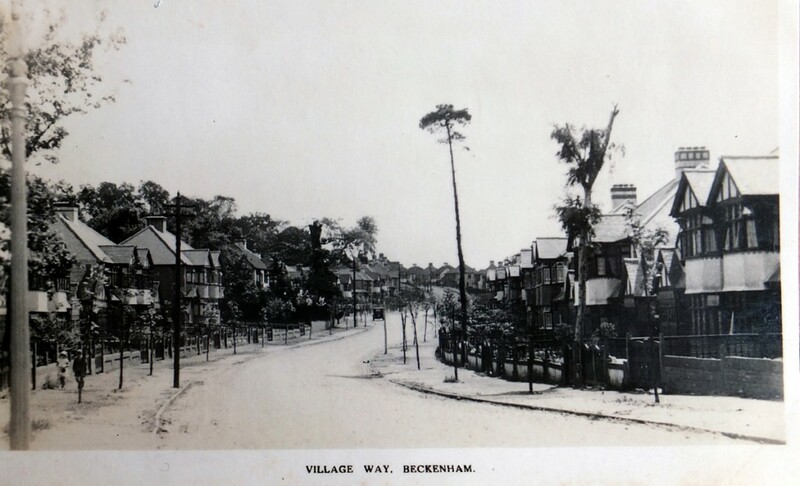 It opened in 1891 after action by leading members of the community, led by the proprietor and publisher of the town’s newspaper, the Beckenham Journal, T.W. (Tom) Thornton. 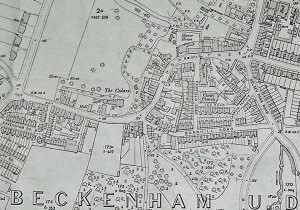 Beckenham’s population had grown tenfold since the railway arrived in 1857 and they feared there would be no open spaces left. The park proved to be a popular venue for recreation, civic activity, fairs and exhibitions. In 1905 it saw the launch of the first airmail in a gas filled balloon. Harold Bride, the radio officer on the Titanic was given a heroes welcome when he was carried around the park shoulder high and asked to speak from the band stand. Charity events raised large sums for Beckenham Hospital and the annual flower show matched Chelsea. It was part of the Charter celebrations when Beckenham became a Borough in 1935 (see newsreel film here). The most significant event in the post war years was the use by David Bowie and the Beckenham Arts Lab who held a Free Festival in the park in 1969 – the first of the future King of Rock’s four formative years in the town.